If you’re shopping around for the right ski goggles for your next skiing trip, then it’s a pretty exciting time as that means that your holiday is just around the corner. Having so many choices on the market is great, but it can also make the whole shopping process quite exhausting. That is because you do not even know where to start. With that in mind, we’ve taken a closer look at one pair of ski goggles for women from Smith Company to see what they offer, who they are best suited for, and how they match up in the market. Smith is one of the leading brands in the ski and snow optics market. With over 50 years of experience in manufacturing ski goggles, they have been innovating and advancing ski goggle technology with their Chromapop polarized lenses, and they were also the first brand to introduce interchangeable lenses. This product can be used by pretty much any woman who is looking for ski or snow goggles for their next winter sports holiday. The strap can be adjusted on both sides of the head, making it easy to use for both left- and right-handed skiers or snowboarders. However, due to some problems that can come about with helmet compatibility, these goggles would be best suited for a woman who already has a Smith helmet or is looking to purchase a Smith helmet. The Smith snow goggles arrive neatly and safely packed in a box with one extra lens, a replacement lens sleeve to protect your extra lens while you are carrying it, as well as a microfiber goggles bag. 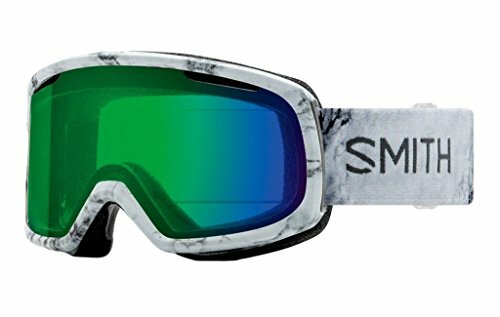 These snow goggles from Smith feature a responsive fit design, which means they are flexible and easy to adjust to the shape and contours of your face, making them a very comfortable mask to wear. Unfortunately, these goggles only have two-layer face foam. Nevertheless, considering the price bracket these goggles is in, the two-layer foam and responsive fit are a great value. On another note, the strap can be adjusted on both sides which is great for left- and right-handed users, while the clips all seem to be really high quality and the strap is ultra-wide. Also, the back of the strap has silicon so it will stay securely on your face or head, even if you have a fall. What we particularly love about these goggles is that you get an extra lens and sleeve, which is rare for many goggles available in the market. You can also choose from 19 color options, and once you’ve chosen your preferred color lens and frame, Smith will send you another lens that will complement what you have bought so that you have a lens for bright and low-light conditions. The lens tech is second to none as well! Using carbonic-x for better scratch and impact resistance, Chromapop for increased clarity and natural color, as well as Fog-X anti-fogging treatment which is carved into the lens, it can’t be wiped away like other anti-fog treatments. One major drawback to these goggles though is that they have a cylindrical, and not spherical lens. Spherical lenses offer better peripheral vision and help to reduce glare so it’s a real shame that these goggles don’t feature that. When you’re out on the slope, be sure to make the most out of these goggles by taking the spare lens with you as you never know when the conditions will change. Also, to ensure you have the best visibility, you can change the lens of your goggles on the spot and continue enjoying your day. We compared the Smith snow goggles to a pair of unisex goggles from Zionor. The Zionor X4 Goggles has a spherical lens which increases peripheral vision, and magnets are used to hold the lenses in place so that they can be easily changed. Unfortunately, these goggles don’t come with a spare lens so you would ideally want to purchase another lens on top of this product so that you have lenses suitable for both bright and low-light conditions. These goggles are also integrated with plenty of lens tech. They are integrated with scratch- and impact-resistant outer lens that also has UV protection and anti-fogging features. Additionally, the frame is flexible and has three-layer face foam for ultimate comfort. This was a really close call as we feel that the Zionor goggles had everything we were looking for on our tick list while the Smith Riots were lacking the spherically shaped lenses. However, we still prefer the Smith goggles overall for some reasons. Firstly, we preferred the slimmer, understated look of the Smith goggles. Secondly, looking at the actual lenses, we love the superior tech offered by Smith such as the anti-fogging technology as compared to the Zionor lens coating that comes off easily when you wipe the goggles. The icing on the cake is that Smith came with an interchangeable lens, making you ready for all weather conditions with just one purchase.